Choosing a college to obtain your degree from is a tough choice. With all things considered, a key feature in attending college is finding friends, having fun and socializing While some schools tout their gourmet cafeteria and others their first class laboratories and mathematic programs, others still are keen on positioning their University with a wonderful and exciting city as the backdrop. Whether it be unlimited networking capabilities, great restaurants or even just an array of awesome bars, these cities will keep you going long after classes have ended for the day. College is four years after all; don’t you want to have some fun while you’re there? Here are the top cities in the country for amazing college nightlife. 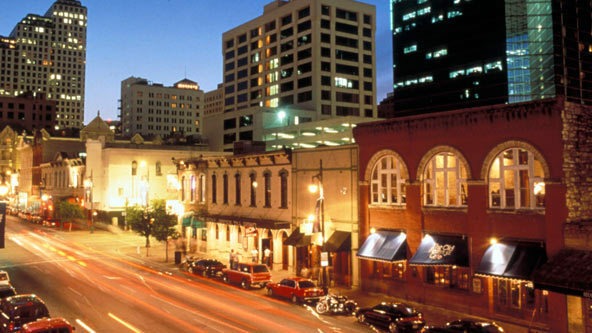 Though Texas may not seem like the place to attend school if one is looking for the social aspect, it is exactly this little secret that makes Austin so appealing. Enjoy great food from hearty meats, Mexican influences and soul food favorites, and explore beyond the table to find some of the best dance floors this side of the border. “6th street is the spot to be if you are a college student,” states Francisco Tamayo, an Accouting major at the University of Texas at Austin “It is really convenient if you go to UT because there are buses that go back and forth from downtown to campus.” Only in Austin can you line dance, salsa, crump, swing and then some, all in the same night, and quite possibly at the same venue. Tamayo really thinks “the great thing about the Austin night life is that it is so accepting. No matter where you go, the people in and around the Austin area are accepting of everybody’s differences. So naturally, you run into some of the most interesting people.” Check out Azucar for a Latin spin on all kinds of music, The Dallas Night Club to shake your boots and your booty, or Cedar Street for swing if having two feet on the floor doesn’t sound like real dancing. All that dancing is sure to make one thirsty; hit up Party Barn Beverages for an array of cocktail and beer choices. Atlanta, or the infamous ATL as it’s acronym, is the Mecca of the South. Known for creating an entire genre of music and dance, the Dirty South is not shy when it comes to showing students and residents a great time. Kevin Clarke, a student at Georgia State University likes that ATL is home of the A.U.C, or the Atlanta Colleges and Universities, which “is special because all the schools in the area work together to throw parties and step shows which gives it a huge HBCU feel.” As a known DJ, Clarke is also a fan of the ” Georgia Dome’s annual Battle of the Bands for hgh school and college groups,” which allows him to hear the new hot music. Head toward midtown to get your taste of the club scene with hip spots like Opera, Velvet Room, or the plush Gold Room for the who’s who of the Atlanta scene. Beyond the political jargon and the stuffy suits, D.C is where a student can learn, network to change the world, and still make it to a chic dinner and drinks after. Whether you are a Howard Bison, A George Washington Colonial or an American University Clawed, everyone in D.C partakes in the city’s rich culture and abundance of food, shows, lounges and global-awareness events. “In D.C there is always something to do and get incolved in,” states Luis Serra, a former student at American University of International Business. “You meet cool people, go out, enjoy the night and make ’em friends.” Study until the sunsets and break free with laughter at the up-and-coming Riot Act Comedy and dine on a decadent chocolate infused menu at Co Co Sala, have fun ad get rowdy on the ever popular U-Street or romance on a scenic rooftop at The Reef in Adams Morgan. Look for special events with the vast array of Museums and Cultural Institutions downtown and at the Washington Mall for exclusive local affairs throughout the year. For the student who is looking to explore the world beyond a textbook, New York City is exactly the place. Attend one of the primer schools for liberal arts or film like New York University or The Parsons New School. New York doesn’t just have hot spots, it has hot locations like Hells Kitchen or The Meat Packing district, both prime for great bars, gourmet food and a ultra hip music dance scene. For beers on a budget, try the Brass Monkey or Hogs and Heifers, and hit the dance floor at Plunge at the Gavensport Hotel, where the view alone will leave you breathless. If the abundance of variety and options in this 23-mile metropolitan seems overwhelming, simply ask a local; some of the best spots in New York City are not listed or advertised. If being bi-coastal doesn’t sound like a plan, choose somewhere toward the middle with Chicago. This increasingly modern and edgy city boasts some of the best schools for research and learning like Northwestern University, The University of Chicago and the University of Illinois at Chicago. When class is over, check out Piece for cheap eats and good beer, or Moonshine Brewing Company for a drink on the patio or the original UNO pizza. Shake it on the dance floor with live Rhythm & Blues at Kingston Mines For something out of the ordinary, chart Chicago’s water inlets with a dinner and show voyage on the Entertainment Cruise.